Ave came to me with the wish to have a bag that would fit all the everyday needs of a modern woman. She is a perfect example of a busy contemporary female specimen – working as a media adviser her day often involves running never-ending errands, writing press releases in record time, photographing the everyday achievements, travelling to the places of action and also taking part in festive receptions and cultural ventures. It is remarkable that in her turbulent life she still finds time for herself and in the end of a long day you can find her riding her bike or cooking and dining with friends or reading a book together with her purring cat. Ave wanted her bag to be big, to fit her whole demanding life. It had to look like an everyday accessory that would be easy to pair with sneakers as she actually sometimes does run from one meeting to another; but it also had to look dashing enough to pair with high heels and a frock for those days that end on a more festive note. In addition, the bag had to be ready to face some serious filing action – i.e. several different-size compartments – as Ave loves to see her things in order. After analyzing all these aspects, testing some mock-ups in front of the mirror and organizing all kinds of gadgets in different bags in the studio, our search process lead us to an unexpectedly simple form – Ave’s bag is basically a black square. No-fuss geometry appeals to the both of us and we voted out all additional details with total consensus. 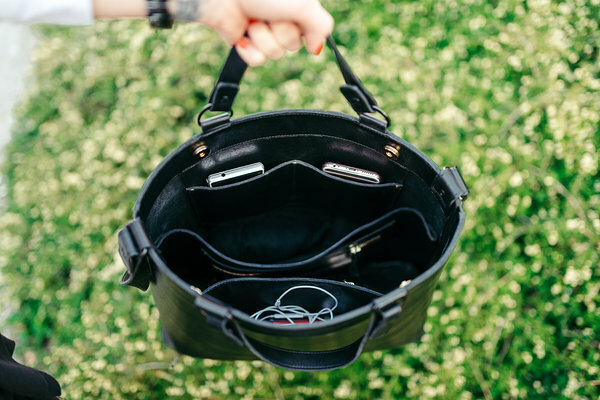 It has a long removable strap making it easy to wear over the shoulder and also in hand as a “slightly” over-sized hand-bag. The inside of the bag hides an elaborate world of two bigger compartments with 6 pockets in total and a separate place for keys – just enough to maintain order in such a big bag. Personally the square form of this bag has totally enraptured me and I can find myself instinctively using it in other designs. For quite some time already I have been drawn to bigger dimensions in accessories and thus Ave’s wish to get a really big bag made my heart jump with joy! The bag has proved to provide good service for Ave in all the situations of her life since and we can contently say that it was a successful project. I was also highly flattered that Ave came to me for her custom-made friend – it is truly a dream client who trusts my style as a designer and at the same time knows the exact functional needs of the bag-to-be. Work is just play and fun if you have such energetic happy people as your clients. I hereby render my thanks. And also bob a curtsy with the excitement I just cannot hide. The evening scenes of the Tallinn city were captured by Tõnu Tunnel.